The plaza marked the northern end of the Millionaires’ Mile which culminated in Cornelius Vanderbilt’s French Renaissance chateau at the corner of 57th Street (later to be extended the full block to 58th). On October 13, 1883 New Yorkers got the first hint that different type of structure was about to appear in the neighborhood of brownstone mansions and private carriages. The Real Estate Record & Builders’ Guide reported that developers Phyfe & Campbell had purchased 12 plots “on the Fifth avenue plaza, extending from Fifty-eight to Fifth-ninth streets.” The land was acquired from the estate of John Charles Anderson, who had recently died leaving an estate of over $7 million. Now, reported the Record & Guide, “We understand that George W. Da Cunha is the architect, and that the building will be nine-stories high, and strictly fire proof.” At the time, Da Cunha’s latest project (also for Pyfe & Campbell), The Gramercy, a Queen Anne cooperative apartment house on Gramercy Park, was just being completed. The Guide said that the new building would “be an adaption, though on a much larger scale, of the Gramercy apartment house” and would cost an estimated $1.5 million. Charles A. Gerlach responded that, no doubt, they would, and the public would know “as soon as the plans of the architect, Mr. Carl. Pfeiffer, are completed.” It was the first mention of a change in architects. Within weeks George W. Da Cunha sued the developers for breach of contract, asking $10,000 in damages. A panel of architects, including Richard Upjohn, was assembled as jurors. They all agreed there was a broken contract. Phyfe & Campbell had gone with a third choice—the firm of McKim, Mead & White. This time they stuck with their decision. It was a wise move; for the series of misfortunes would continue. In changing architects the developers had changed plans. No longer would the building be an apartment house, but a high-class hotel. By the time Pfeiffer’s letter was published, construction was well underway and a month later the roof was already completed. On the morning of March 22, 1886 two masons, Dominick Badaracco and John Lyons, were on the seventh floor, working on scaffolding. At 9:45 one of the men rang for more mortar to be hoisted up. As the 500-pound box of mortar reached the seventh floor, it struck the scaffold, tilting it. Lyons jumped from his perch, grabbing onto the suspended mortar box. Badaracco went crashing seven floors into the basement along with the heavy spruce timbers of the scaffold. As the debris crashed through the floors, it took builders Charles McCauley and Thomas Lenihan with it. Workers found the men buried beneath the wreck of timbers. Dominick Badaracco was dead and the other two severely bruised and cut. In 1887 construction was delayed when John Charles Anderson’s niece claimed she was owed one-fifth of the property purchased by Phyfe & Campbell. The issue became more complicated when a daughter, Mrs. Laura Appleton, filed suit for her one-fifth of the estate. Sadly for Phyfe & Campbell, the costs and vexations were too much. 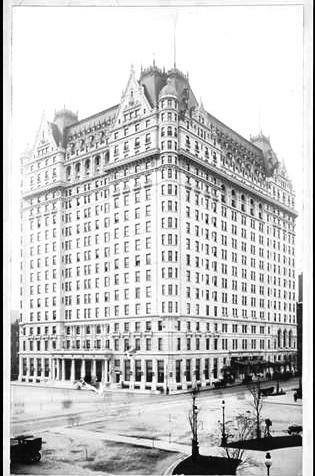 In August 1888 they lost the unfinished Plaza Hotel with nearly $1 million due on the mortgages. The Times remarked in November that year, “The undertaking finally caused their ruin.” The new owner, the New-York Life Insurance Company brought in 1,400 workmen to hurry the construction along. 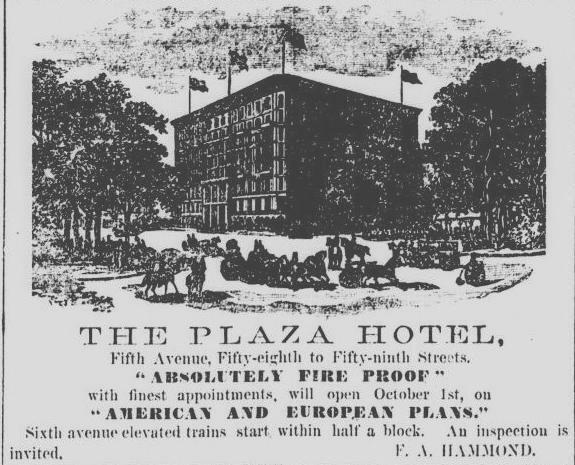 On January 18, 1890, nearly seven years after plans had been announced; the Real Estate Record & Builders’ Guide promised “The Plaza Hotel will be opened in the spring.” It was an optimistic promise. 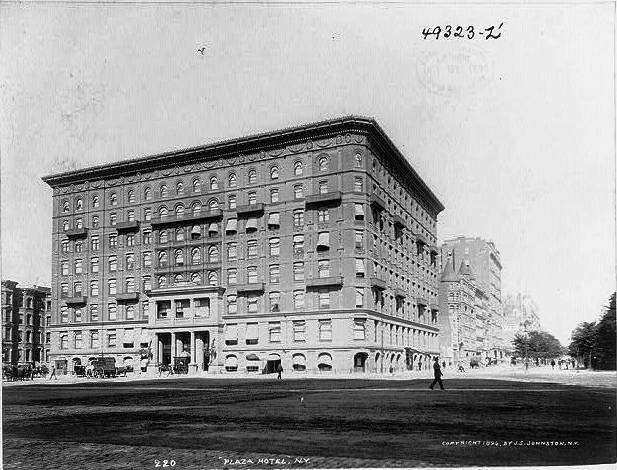 On May 22 The Times reported “There is more trouble over the Plaza Hotel property at Fifth Avenue and Fifty-ninth Street. This land has been in almost constant litigation for many years.” Laura B. Appleton had reared her litigious head once again, now suing the New-York Life Insurance Company for $100,000 in damages. Finally, on Tuesday, September 30, 1890 the New-York Daily Tribune reported “The Plaza Hotel is finished, and another great house has been added to the host of New York’s splendid hotels.” Saying that the “elegance and beauty” of the hotel was such that it would take volumes to describe, the newspaper did its best. “In the café the electric light is filtered through squares and ovals of jeweled glass and gleams from the brilliant petals of glass flowers pendant from the ceiling,” said the Tribune. The first grand entertainment in the Plaza was a dinner hosted by 100 veterans of the Army of the Potomac for the visiting Comte de Paris. The Plaza dining room was filled with some of the most illustrious names of the war that evening. During one toast, General Daniel Butterfield reminded the gathering of the part the prince and other French nobles had played in the Civil War. The Plaza Hotel quickly became a favorite for visiting dignitaries. On December 14, 1890 The Times mentioned that Secretary of the Treasury William Windom was staying here; and on October 4, 1891 The Sun reported “Mrs. Benjamin Harrison, wife of the President, arrived in the city at 6:50 o’clock last evening, and went to the Plaza Hotel.” Accompanied only by a maid, she had traveled alone on the train. About seven months before Mrs. Harrison’s arrival a disagreement between two employees ended tragically. When the hotel opened, two of the newly hired porters were Seth W. Thomas and 32-year old R. H. Rodgers. Rodgers had just arrived from Wheeling, West Virginia. Wages for low-level black employees were low and housing was relatively expensive. So the recently-married Thomas took on Rodgers as a boarder. Trouble started early in February 1891 when Rodgers was let go for incompetency and he began drinking. The caliber of guests at the Plaza Hotel was not only reflected in the names on the guest register—including in 1892 Colonel and Mrs. William Jay; Mr. and Mrs. W. K. Vanderbilt; and O.H.P. Belmont; all of whom arrived from Newport and stayed here while their mansions were prepared—but in the cost of the rooms. Railroad man Charles G. Patterson lived here during the winter of 1892, paying $75 a week for his rooms; more than $2,000 in 2015 dollars. Other celebrated guests at the time included Samuel E. Morse in June 1893; Germans Baron Munchausen, Major von Meckow, and Captain von Blottnitz who had been to Chicago to visit the Columbian Exposition; and in 1894 Vice President Adlai E. Stevenson and his wife. A month before the wedding of Consuela Vanderbilt to the Duke of Marlborough, the bridegroom checked into the Plaza Hotel with his cousin and best man, Ivor Guest. The Duke, almost immediately, began drawing press attention, not all of it favorable. 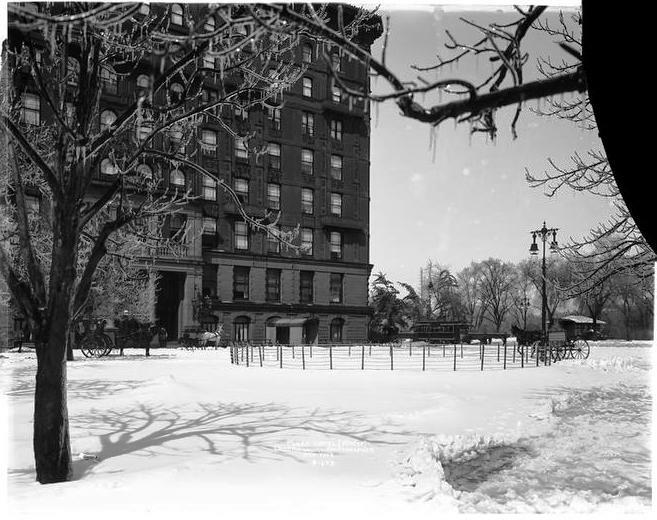 The Plaza was briefly the center of a socially-scandalous incident in April 1897. Elliott F. Shepard was the son of deceased millionaire Elliott Fitch Shepard and Margaret Louisa Vanderbilt Shepard, the eldest daughter of William Henry Vanderbilt. Margaret Louisa Shepard was shocked to hear that her only son (to whom, The Times said, she had heretofore “shown great generosity”) had secretly married Esther Wiggins—the divorced daughter of a storekeeper in Greenport, Long Island who was about five years older than Elliott. When his mother found out about the civil service marriage, she insisted on a church wedding, which took place the first week of April 1897; “although she was too much prostrated by the news to attend it,” said The Times. The newspaper suggested that the newlyweds’ financial future hinged on Margaret Louisa Shepard’s disposition. 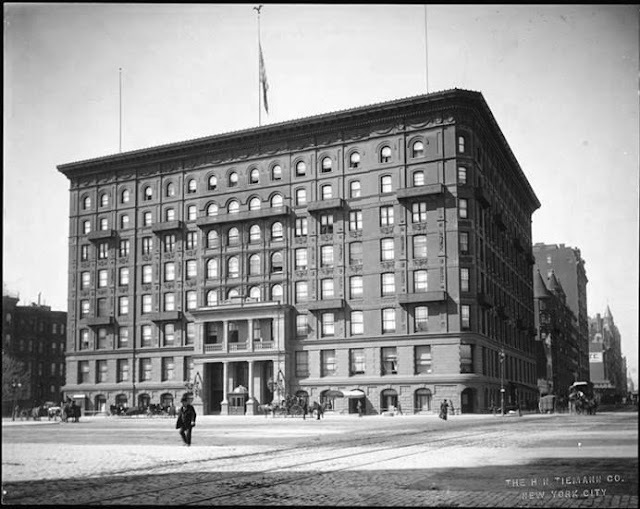 Elliott and his new wife moved into the Plaza Hotel after the church wedding; but it would not be for long. 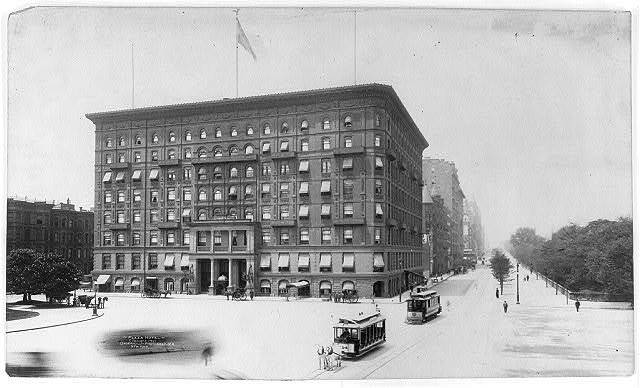 On April 13 The Times reported “To avoid callers and escape the penalty of the notoriety that their secret marriage has caused, Mr. and Mrs. Elliott F. Shepard left the Plaza Hotel early yesterday, and did not return until late at night. It is their intention to sail for Europe this week.” Margaret Louisa Shepard suggested they take an extended trip. “By the time the young couple return gossip about the affair will have blown over,” it was thought. Finally the blaze was extinguished and “then it was realized how well the construction of the hotel had stood the test.” Even though the Staples suite was in ruins, the structure of the hotel was unscathed. Nevertheless the building suffered $20,000 in water and fire damage. The sturdy construction of the hotel would make little difference in only five months. The building was sold for $3 million to Fred Sterry of Hot Springs, Virginia—deemed by the Record & Guide as “the most important cash sale of real estate in the history of this city." He laid plans for a new 17-story Plaza Hotel from plans by architect Henry Janeway Hardenbergh. Hardenbergh’s famous landmark survives as a familiar Manhattan icon and McKim, Mead & White’s original Plaza Hotel is long forgotten. I wonder what became of auctioned contents or the mentioned mosaic floor or the smoke room table?